DALLAS — More than 30 parents of Jewish students met with leadership of the Richardson Independent School District (RISD) on Feb. 19. The program featured a presentation and remarks by RISD Superintendent Dr. Jeannie Stone and RISD Board of Trustees President Justin Bono. As part of its Education Initiative, the JCRC initiates programming, and offers support and guidance, to help Jewish students attending public school to be successful in the public school environment. The JCRC provides accurate and unbiased educational resources about Jews, Judaism, and Israel to public school districts. It also convenes and connects parents of Jewish public school students with one another and ISD leadership, and coordinates educator trainings and workshops on teaching about Israel and the Middle East. The RISD leadership shared statistics on RISD students, as well as information about the school district’s model and strategic planning. A Q&A session followed the remarks, allowing parents to ask questions and share experiences. The JCRC has held similar meetings for parents of Jewish students in Allen, Frisco, and Plano. 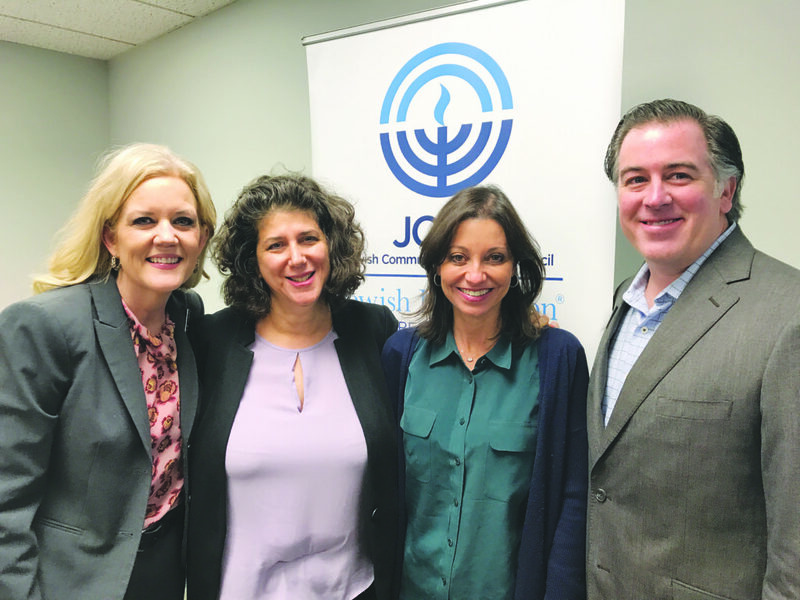 “The Jewish Community Relations Council helps support the success of Jewish students in public schools by connecting parents to understand what is happening in the classrooms, as well as ensuring accurate information on Jews, Judaism, and Israel in textbooks,” remarked JCRC Chair Melanie Rubin. For more information, contact the Jewish Community Relations Council at jcrcdallas@jewishdallas.org. Photo: Mark Ford The Rosenfield House — or The Blue House — at the site where it was built in 1884, on the road, and now at its new location at 1419 Beaumont St., is like “a grand Lego house,” said developer Mark Martinek, who with Jay Baker is renovating the home. A change of address card is in order. The Rosenfield House, also known as the Blue House, has, over the past year, made its way from its original home, at 1423 Griffin St. in Dallas, to where it stands now, just blocks away, at 1419 Beaumont St. The fifth oldest home in Dallas continues to stand strong. What began in April 2017 became reality 10 months later, in May 2018. The move enabled the architecturally and historically important house to be rehabilitated and re-used, and to fill in a vacant lot with other single-family homes. The two-and-a-half-story Queen Anne-style house in The Cedars was built in 1885 for Jennie and Max J. Rosenfield. It was the model home for its subdivision, and within the confines of what was then the heart of the Jewish community. These days, the home has local connections. Dallas’ Alex Ray (husband of TJP publisher and editor Sharon Wisch-Ray) is the great-grandson of the couple. The couple’s son, John Rosenfield, Jr., began his career with The Dallas Morning News in 1923 and served as its art critic for 41 years. The Blue House was sold in 1889 and in 1897, and its last inhabitants owned the home from 1942 to 1980. Vacant for five years, it became the Trinity Center drug rehabilitation center. In the last decade, the property was used as a halfway home, then vacated. Time Warner acquired the home in 2015. Jewish community member and journalist Robert Wilonsky saved the house; it was he who first saw bulldozers in front of the property, then called David Preziosi, executive director of Preservation Dallas. Katherine Seale, chair of Dallas’ Landmark Commission, addressed City Hall as the next step to halt Time Warner from demolishing the house to make way for an office and parking lot. Two-plus years later Time Warner stopped demolition, and paid for the building’s move. “It’s in surprisingly good shape, with a good roof and strong foundation. 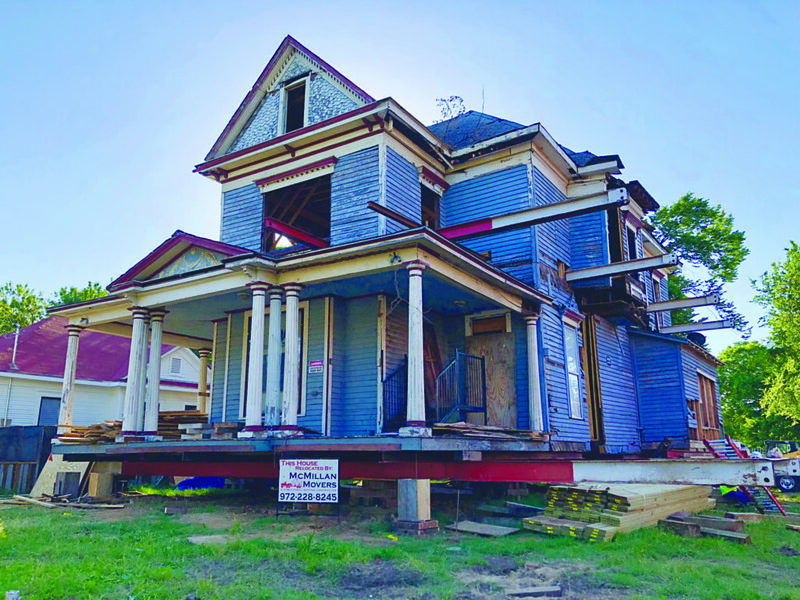 This isn’t a fix-and-flip project, not a lucrative project, but one to save a bit of our history from demolition,” said Mark Martinek, who lives three blocks away, in a home built in 1902. To make the move, the home was cut into sections and the main house was stacked like great shelves in five major pieces, the piers and the carriage house following. Once the new foundation was in place, the house was reassembled at its new lot. It was first built long before Facebook or even Polaroid pictures were popular, so there are few photos of how the house first stood. What needs to be reproduced is happening here in Dallas. Martinek, who is partnering with Jay Baker on the project, is not on the clock for the house’s completion. The expense — and it’s grand — and the methodical care and trueness of the work are his priorities. The team is working with the pine trim and moldings, the stairways and historic windows, to reproduce what was. However, they are updating the wiring and plumbing. What the eye sees on the exterior will be how it was. Internally, this will be an energy-efficient and in-every-other-way-appreciated home of 2020, when move-in is likely. Birnbaum, who has won numerous awards including Preservation Education and Texas Media awards from Preservation Texas for his film “Restore,” is excited to have his film covering the Blue House, as it begins its second life in a third century. “We are trying our best to recreate it back to its origin, with materials as best we can. Our first job was to literally move the building and put it back together — an amazing jigsaw puzzle of sorts,” Martinek said. Ethan Freed (back row, far left) was elected Grand Aleph Gizbor (treasurer) and Kian Roy (back row, third from left) was elected Grand Aleph Mazkir (secretary) when BBYO held its annual International Convention in Denver Feb. 14-18. 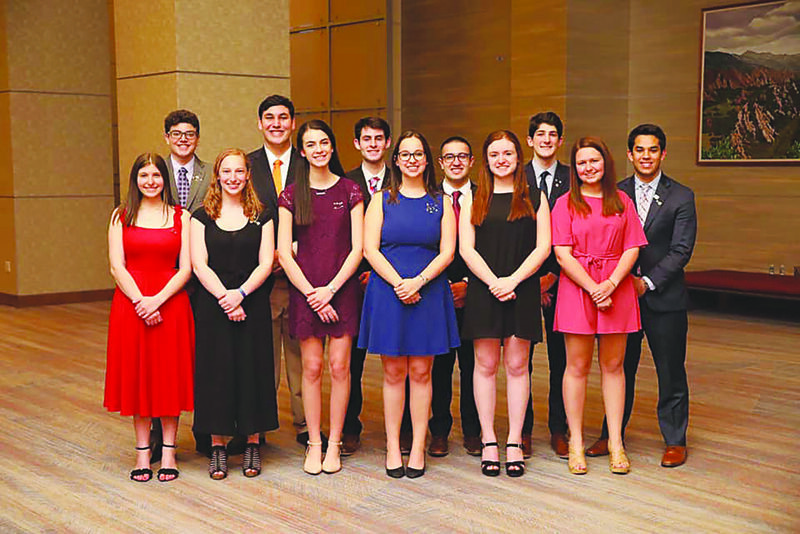 More than 120 teens from the BBYO North Texas Oklahoma region gathered with more than 3,000 Jewish teens from around the world at the organization’s International Convention in Denver over President’s Day weekend, Feb. 14 to Feb. 18. The convention featured seminars, as well as celebrities, business leaders, political figures and philanthropists from more than 36 countries. It was co-planned by local teen Aidan Jacoby, who is BBYO’s international vice president. Jacoby, son of Karla and Eric Jacoby of Plano, described the planning process as a marathon, with lots of late-night phone calls, stressful meetings and management of close to 300 teens, However, once he stepped out on the stage during the convention’s opening ceremonies and saw the entire convention body for the first time, it was all worth it, Jacoby explained. The “team,” as Jacoby refers to it, consisted of the IC steering committee made up of other BBYO teens from around the globe. This committee was led and supervised by Jacoby, who credited the convention’s success to this group. “Their hard work made convention possible, and being able to celebrate with them after their programming was implemented was very rewarding,” he said. Two North Texas teens — Kian Roy, son of Jenni and Gavin Roy of Dallas, and Ethan Freed, son of Dana and Larry Freed of Plano — were elected to the International Board for the 2019-2020 term. Roy, who was elected Grand Aleph Mazkir, or international secretary, said his motivation to run stemmed from the opportunity to make an impact upon others. 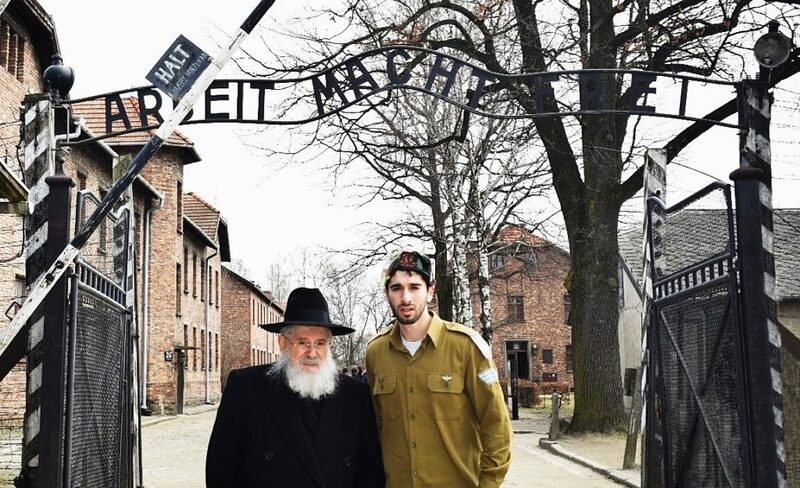 He is excited to act as a leader and role model for the next generation of Jewish teens. In his new position, Roy will be responsible for coordinating the International Leadership Training Conference, a three-week summer session at BBYO’s Perlman Camp in Pennsylvania. Ethan Freed was elected to the position of Grand Aleph Gizbor, or international treasurer. Inspired by past members who continued to push him further into his BBYO journey, Freed is grateful and excited for the opportunities that are ahead. “Past members of my chapter put their time and dedication into me, and I knew that I had to give back to the organization that gave me so much,” he said. As the new treasurer, Freed plans on using his position to make a real and lasting impact on the organization. Dallas will host the International Convention next year. The city will welcome over 5,000 teens, guest speakers, stakeholders, and performers over the weekend of Feb. 13-17, 2020. With local leaders like Roy and Freed at the helm, IC 2020 is sure to continue its legacy of success and Jewish continuity. There will be many volunteer opportunities to get involved with the planning of IC Dallas. Email Lory Conte, BBYO senior regional director, at LConte@bbyo.org to learn more! Throughout millennia of our existence, we’ve transformed from family to tribe, and from people to nation. For thousands of years, we’ve retained a distinctly Jewish ethnicity, culture and system of faith. We’ve consistently referred to ourselves either as “Am Israel” or “Bnei Israel,” the People of Israel or the Children of Israel. But our understanding of ourselves changed when, in the 18th and 19th centuries, Jews facing the beginning of the modern era had to decide how to survive as the world changed around them. Movements such as Bundism, Zionism, ultra-Orthodoxy, and Communism offered unique visions for our people’s future. Despite the fact that their assimilation did nothing to save these Jews from the gas chambers, and despite the fact that sacrificing identity for the sake of financial opportunities is halachically forbidden, these Jews succeeded in redefining what it meant to be a Jew in the Western world. They were so successful that Abraham Geiger, one of the founders of Reform Judaism, called Jerusalem “a noble memory from the past that holds no hope for the future.” So successful that former American Jewish Committee president Jacob Blaustein “repudiated vigorously the suggestion that American Jews are in exile.” So successful that most Americans, Jews and non-Jews alike, consistently refer to Judaism as a religion and nothing more. Thousands of years of national identity and yearning for Zion were cast aside when they became inconvenient. And while calling Judaism a religion instead of a religious ethno-national group might seem, at minimum, insignificant and, at maximum, a symbol of assimilation, this difference in terminology has dark consequences. It simultaneously divorces young Jews from their national heritage, and is at the heart of the American understanding of the Israeli-Palestinian conflict. American Jews and their political allies often praise Israel as a place of refuge for Jews around the world (at least those Jews who weren’t lucky enough to become American), a country that offers Jews sanctuary amid growing global anti-Semitism. But this flawed definition of Israel’s purpose, to merely be a place of refuge, easily lends itself to anti-Israel sentiment. Why should Americans support Israel, a place of refuge, if its existence in the Middle East is “unjust” to the Arabs of the region? Why should Americans support Israel, a place of refuge, if Jews can find refuge just as safely in the United States? Why should Americans support the “Jewish state” if Judaism is just a religion? Since when do religions need states of their own? This is why Israel exists, not as a place of refuge but as the natural aspiration of our people to live once more in the land that gave us life. Our national history, and our identity as a united people with deep roots in the Levant, are our only legitimate rights to this land. When American Jews promote this widespread and damaging myth that Judaism is just a religion, they perpetuate falsehoods about Israel’s purpose and lend a hand to those who wish to delegitimize our state. It’s time for American Jews to reclaim their national identity, for their own benefit and for the security of the State of Israel. 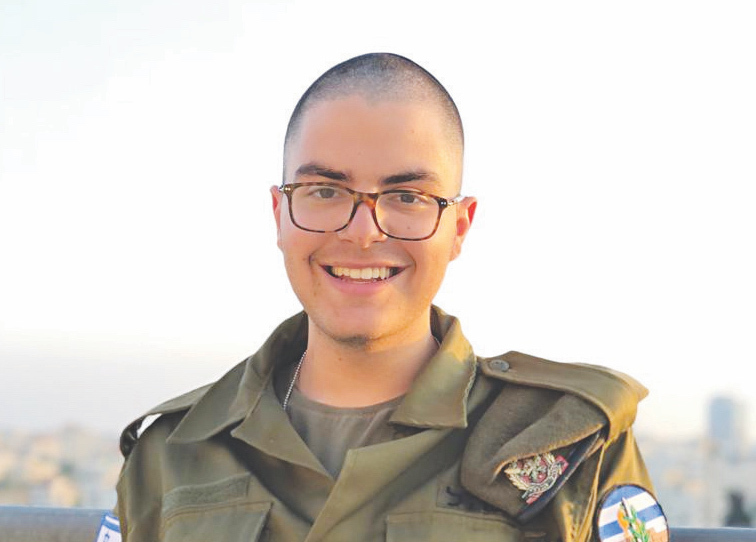 Dallas native Matan Rudner made aliyah in August 2017 and serves as a Lone Soldier in the IDF. Today may be the last day of Black History Month, but it can also be the first day that you consider looking into the historical connections of black people and Jews. There is a strong relationship, if you are willing to examine the facts. Both black people and Jews have faced death from the hands of their oppressors: Jews faced the death of their first-born sons in Egypt, followed in our time by the gas chambers and crematoriums of the Nazis. Black Americans, as slaves, experienced the possibility of death or horrible punishment by the whims of their overseers. Lynching of black people in the South and elsewhere occurred after the Civil War, as part of an informal, repressive system to keep them “in their place.” It may not seem so today, but it was not that long ago, historically speaking, that America’s Jews experienced prejudice and discrimination in their daily lives. For example, during the 1950s in Chicago, Jews and black people were equally baited. “Jewtown” became a section of Chicago where Jewish and black musicians, as well as tradesmen, could intermingle freely, separate from mainstream Chicagoans. In many ways, the civil rights struggle was also a Jewish struggle, first in Eastern Europe against the Czarist-supported pogroms which terrorized every Jewish shtetl. Then fleeing to America, seeking safe, new lives in a strange new land, Jews were forced to struggle again to adapt and be accepted, without giving up their heritage. As Jews, we should embrace our rich multicultural history, which includes people of color. Darrin Bell , cartoonist; David Blu, basketball player; Lisa Bonet, actress; Sammy Davis, Jr., dancer and singer; Ada Fisher, physician and politician; Aaron Freeman, comedian; Capers C. Funnye Jr., rabbi; Lewis Gordon, philosopher; Reuben Greenberg, criminologist; Lenny Kravitz, musician; Sandra Lawson, rabbi; Adah Menken, actress and poet; Alysa Stanton, rabbi; and Andre Tippett, football player. Here are some interesting achievements among black Americans. Another black inventor was Elijah McCoy, whose parents were runaway slaves that fled north to Canada, before returning to the United States after the Civil War. As a teen, Elijah journeyed to Scotland to study engineering, but, upon returning to the United States, could only find a job as a railroad fireman. One of the most important inventions of World War II was developed by Dr. Charles Drew, while he was a medical student at McGill University in Canada, during the 1930s. Drew invented a process for preserving blood plasma, which allowed quantities to be stored and transported over a period of time. Before the United States officially entered the war, Drew helped supply Great Britain with needed blood plasma in its struggle against Hitler’s onslaught. Once the U.S. entered the war, Drew was put in charge of the blood collection program for America’s troops. Against Drew’s objections, the plasma collection was segregated, dividing white from black donors. Drew spoke out against this racist policy, but the Army refused to change their policy, so he resigned in protest. America’s modern blood bank storage system owes a huge debt of gratitude to the work of Charles Drew and his assistants. Many thousands of America’s soldiers, sailors, marines and airmen survived the war because of the process he developed in helping to maintain an adequate blood supply wherever it was needed. As Black History Month draws to a close, it’s a good idea for us, as Jews, to seek out similarities and successes in our backgrounds, rather than dwelling on the differences. I arrived in Dallas in 1980. How many of you can go back there with me? The Dallas Jewish Community Center was quite different from what it is now. My husband and I joined quickly, mainly because we could play ping-pong there. I don’t see any table any more. In the middle was a sort of reading room: Large tables, racks of newspapers, some tall shelving units holding reference books — most of them Jewish. In the front, you were in the library. Not much of a library, as libraries go; now we have the full-scale Tycher Library on the second floor. But then, that was it. Some shelved books, and a rack of old paperbacks that were routinely given away. This little haven for readers was presided over by Judy Borejdo. I walked in there one day wearing a T-shirt I’d gotten on a recent trip to Australia; Judy recognized it right away as the design of a friend of hers. That’s how I learned this ersatz “librarian” had a fascinating history. It vanished very recently, with Judy’s death. After the JCC’s remodeling, after a real library was created on the second floor, Judy followed it upstairs. She was not a professional librarian, but nobody had more interest in books than she did. That’s why she had the task of running that mini-library on the first floor, likely as a volunteer. I’m sure nobody else wanted to do it. Things were different in the new environment. There were computers, comfortable chairs and separate spaces for adults and children. And suddenly, there was so much activity. A committee was organized to help direct the new library’s policies and programming, there were memberships solicited at various levels and someone — not Judy — was named as director. But Judy stayed on, using her remarkable knowledge of books and what readers would like to see on the new shelves. Finally, a professional librarian was hired, and much that had been hands-on and informal before became more routine. Still, Judy remained. Soon after the start of this year, I led a book discussion in the library. Judy was there. Judy had arranged it, as she had arranged a calendar of book discussions throughout the years, from the library’s move and growth until just a short while ago. Always frail, never completely healthy, Judy became very sick. Soon, she was terminal. She was no longer in the library. Finally, she left us permanently. There was so much rain on the day of her funeral, I had to believe that the skies were crying for her, reminding us of our loss. The Tycher Library is an underused gem on the JCC’s second floor. There’s even an elevator to make access easier. But not so many people read books any more, as e-readers have replaced words on paper between covers for a good many. But if you knew Judy at all, or even if you didn’t, please do me a favor and make that trip upstairs in her honored memory. See what she — a true book-lover — helped bring about. Hold a book, a real book, in your hands and think of Judy Borejdo. She worked hard. She deserves to be remembered. She will be greatly missed by all of us who still read books. (JTA) — Members of a Jewish left-wing group protested a speech by a former Israeli soldier who spoke following Shabbat morning services at the Chabad Jewish Center at the University of Texas in Austin. About a dozen protesters from the Austin chapter of IfNotNow sang protest songs and carried signs reading “Occupation is not moral” and “Moral combat? Moral disaster” as they protested in front of the center Saturday morning. Chabad Rabbi Zev Johnson charged in a blog post that the protesters took photos and videos of people entering the Chabad, including his young children, encouraged his children to join their protest, and prevented guests from entering the building. IfNotNow denies his version of events. IfNotNow in a statement also objected to Chabad characterizing their actions as disrespecting Shabbat. “We know our actions were only mischaracterized because we spoke out against the Israeli occupation,” the statement said. “Why is IDF propaganda allowed in our communal spaces, let alone following Shabbat morning services? That is the real outrage here, not a bunch of Jews standing outside the building singing ‘Olam Chesed Yibaneh’ (We Will Build This World with Love),” the group also said in a tweet. The soldier, Leibel Mangel, an American-born motivational speaker, spoke at lunch following services about visiting Auschwitz with his survivor grandfather, who he said stood up to the SS officer and physician Joseph Mengele during his internment there. He also spoke about his experience of being one of the soldiers to discover the bodies of three Israeli teens kidnapped and killed by Hamas in 2014, according to Johnson. He also led a discussion about morality in combat. 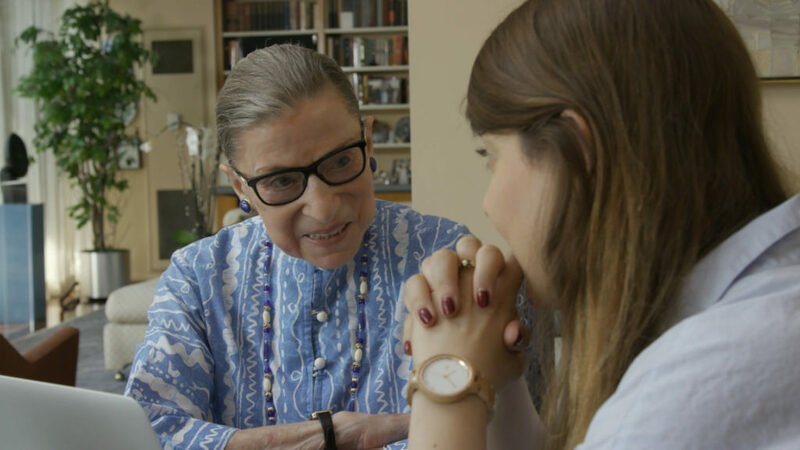 Ruth Bader Ginsburg chats with her granddaughter, Clara Spera in “RBG.” The film is is up for best feature documentary. It’s directed by Betsy West and Julie Cohen. But there has been more drama: the possibility of a new category for best popular film elicited strong emotions and eventually was scrapped; plans to present some awards during commercial breaks to shorten the rather lengthy ceremony were protested by some prominent people, among them Martin Scorcese and Brad Pitt; and a decision to buck tradition by not inviting back some 2018 winners as presenters was widely derided. But there’s always hope. While many expected the recent Grammy Awards to be a disaster following pre-ceremony drama involving performers like Ariana Grande, postmortem reflections were much kinder. * The documentary “RBG,” on Supreme Court Justice Ruth Bader Ginsburg, is up for best feature documentary. It’s directed by Betsy West and Julie Cohen. * “A Night at the Garden,” about a massive Nazi rally held in New York City in 1939, is nominated for best documentary short. * The hit “Shallow,” from “A Star is Born,” is up for best original song. It was co-written by Mark Ronson, the star producer who had a bar mitzvah. Spike Lee gave us a Jewish cop. The veteran director talked to the Jewish Telegraphic Agency about his best picture-nominated “BlacKkKlansman,” in which a Jewish detective helps a Colorado town’s first black cop infiltrate the Ku Klux Klan. “We did not want [it] to become another black-white kind of buddy film, which has been done a million times,” Lee said. A James Baldwin adaptation gave us Dave Franco in a yarmulke. “If Beale Street Could Talk” — “Moonlight” director Barry Jenkins’ adaptation of the James Baldwin novel — is also up for best picture. One of the film’s most moving scenes involves a Jewish landlord played by Dave Franco. ‘Roma’ brought up Mexican-Jewish history (sort of). Alfonso Cuaron’s period piece “Roma” is favored to win at least a few Oscars on Sunday night, including best picture. It is set in the Roma neighborhood of Mexico City in the 1970s; not mentioned in the film is that it used to be one of the city’s centers of Jewish life. A Nazi documentary angered Fox News. The aforementioned “Night at the Garden” made headlines when Fox News declined to run a 30-second ad because of its “disgraceful Nazi imagery” (that’s a little like not running a commercial for breast cancer prevention because of sexual content). CNN and MSNBC later ran the ad. ‘Black Panther’ offered a moment to reflect on black-Jewish relations. The blockbuster superhero flick, which broke box office records and Hollywood assumptions about race, is based on the original Marvel comic — created by Stan Lee and Jack Kirby (born Stanley Lieber and Jacob Kurtzberg) at a crucial juncture in the civil rights movement. The film is nominated for seven awards, including best picture. 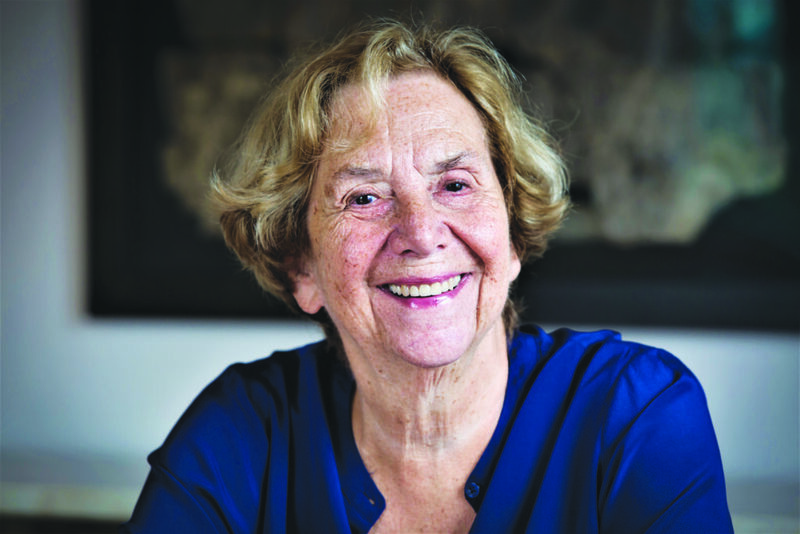 “Grandparents are the hinges of history, reaching back to our own grandparents, reaching forward to our grandkids,” said author Jane Isay, who will speak on March 6 at the Aaron Family JCC. The greatest of loves — of grandparent and grandchild — has lightheartedly, with a sprinkle of truth, been explained as the love between two generations who share “a common enemy.” A morning of understanding the best of this relationship will take place March 6, at the Aaron Family JCC, with family expert and “Unconditional Love: A Guide to Navigating the Joys and Challenges of Being a Grandparent Today” author Jane Isay. The program, cosponsored by the Aaron Family JCC’s Margot Rosenberg Pulitzer Dallas Jewish BookFest and the Goldberg Family Early Childhood Center, is free and open to the public. Isay, who has edited nonfiction books for more than four decades, discovered Mary Pipher’s “Reviving Ophelia,” and commissioned Patricia T. O’Connor’s bestselling “Woe Is I” and Rachel Simmons’ “Odd Girl Out.” She also edited classics, including “Praying for Sheetrock” and “Friday Night Lights.” Before publishing “Unconditional Love,” she wrote “Walking on Eggshells,” about parents and their adult children; “Mom Still Likes You Best,” regarding adult siblings; and “Secrets and Lies,” about family secrets and revelations. “I learned a lot from my authors,” Isay said. For many grandparents, a grandchild offers a second chance to become the parent they maybe didn’t have the time or the energy to be when raising their own children, the opportunity to turn missed moments into wonderful memories. Drawing on her personal experience, dozens of interviews and psychological research, Isay explores the realities of today’s multigenerational families, identifying problems and offering solutions to enhance love, trust and understanding between grandparents, parents and grandchildren. She also provides practical advice from when to get involved, when to stay away, and how to foster strong relationships when separated. “Grandparents are ‘it’ in the eyes of our children and that is the greatest blessing. We have grandparents running carpool, volunteering in classrooms, and touching their grandchildren’s lives every day. It is beautiful,” said Tara Ohayon, director of early childhood education at the Goldberg Family Early Childhood Center. Isay is the daughter of Rose N. Franzblau, a New York Post human relations columnist, and the late Abraham Franzblau, a former dean of Hebrew Union College who also practiced psychiatry. Isay might not have known her own grandparents — all had passed before she was born — but she is, academically and of the heart, experienced in the ties of grandparents and grandchildren. Friends of her mother filled in the “you are perfect no matter what you do position,” she said. “It’s not the blood, it’s the love,” that builds the connection. Jane Isay will speak at 9:30 a.m. Thursday, March 6, at the Aaron Family Jewish Community Center of Dallas, 7900 Northaven Road The event is free; RSVPs are necessary. For more information, visit jccdallas.org/event/jane-isay.